27-year-old Minakshi Rawat, a visually impaired person is a resident of Faridabad, Haryana. She wasn’t blind by birth and completed her education from a mainstream school. She completed her graduation from Maharaja Dayanand Open University, Rohtak and went on to work as a Placement Coordinator and then a Sales Supervisor. After four years of working, Minakshi contracted a brain tumour and ended up losing her vision completely. The sudden loss of eyesight coupled with her loss of independence was extremely saddening for her. She did not know how to move forward, therefore, she sat idle at home for the next four years. In 2018, Minakshi attended an interview held by Manipal Group through a CSR Recruitment Project. There, she was given Eyeway’s contact number in the hope that it would help her find a more suitable job. She then called up the Eyeway Helpdesk seeking information on various employment opportunities available to her. The counselor recognised that Minakshi lacked the basic skills required by a visually impaired person to carry out different tasks in any workplace. So, the counselor advised her to enrol in a computer training course simultaneously with mobility and orientation training. She was also apprised of various organisations that offer such training courses. The counselor also suggested that she watch episodes of ‘Nazar Ya Nazariya’ which is an Eyeway TV series that covers almost all important aspects that play a vital role in the life of a visually challenged person like education, employment, business, art, marriage, laws and rights alternatively. 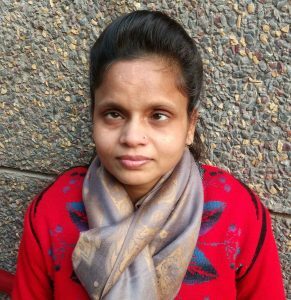 On following up with her, Minakshi said that she is currently undertaking her training from National Association for the Blind, R K Puram, Delhi and has also started using a smartphone. She feels more confident and will soon begin looking for employment opportunities. Dinesh Wankhade, a 30-year-old visually impaired person comes from a village in Amravati district, Maharashtra. He was born with no vision and his parents were less hopeful about his future as they were unaware on how to raise a blind child. He began his education at the age of 4 in a residential school in Chikhaldara. However, he was brought back home when his parents realised that the school did not provide a clean and hygienic environment. A few years later, Dinesh was informed of a blind school within the Amravati district which provided a better educational environment as well as trained their students in music. His parents hoped that a career in music would back up as a profession for their visually impaired son if not anything else. But he was not able to continue further than Class 7 in the same school as they did not have the required facilities to teach. Following this, Dinesh had to shift between two more schools before he completed Class 12. He also faced difficulty with inaccessible study materials due to which he had cleared his Class 12 exams only on his second attempt. Coming from an economically backward family, Dinesh faced financial constraints and had to pursue graduation through correspondence mode. He recognised that visually impaired people are seen as a liability to society and he wanted to change this mindset by serving his community through the public service sector. While pursuing graduation, he came to know about government jobs provided by the Maharashtra Public Service Commission (MPSC) and decided to enrol in a coaching centre to prepare for the MPSC exam. He contacted the Eyeway Helpdesk to seek information on how to purchase a Daisy player which would record his MPSC study material. But on further conversation with the counselor, he realised that he couldn’t even afford a Daisy player. Therefore, as an alternate solution the counselor apprised him of a group named ‘Yashowani’ from Pune which works for visually impaired people by providing audio study material free of cost. He was then guided by the counselor to view the list of books available to him through Yashowani and how to obtain them. While waiting for the required study materials to be couriered to him, the Eyeway counselor motivated Dinesh to do a focused self-study and start his preparation without further ado. We hope to help Dinesh all the way until he realizes his ambition. 14-year-old Sajan Kumar was only three when he lost his vision following a brain fever. Sajan’s parents were not aware of how to raise a child with blindness and as a result, he became entirely dependent on his mother for daily needs. As a teenager, Sajan was unable to eat his food independently. He was living an isolated life tucked away from the outside world. Given his seclusion, Sajan didn’t possess any communication skills, worse he even suffered from a speech issue, unable to articulate his views very well. And recently when his mother passed away, Sajan’s father struggled between working and taking care of a dependent child. He sought help immediately. In a chance meeting with Silver Linings CEO, who works with persons with disabilities including women and children, Sajan learnt about Eyeway. He was told to seek help from Eyeway counselors on rehabilitation. Speaking to his father over a series of calls, Eyeway counselor realised that Sajan needed training for daily functioning and mobility. Simple solutions were suggested in response to complaints like his son was unable to eat food without spilling. The counselor introduced Sajan’s father to the idea of using shallow bowls which would be more convenient to eat from rather than a flat plate. Sajan’s father was looking for some training for his boy so he could eventually become independent and employable. On probing further, and even speaking to Sajan himself, the counselor realised that even before he were put through any vocational or educational training, there was need for the boy to open up and communicate. Sajan told our counselor that alone at home he dances to the songs on radio. Music and dance give him joy in his otherwise dull life. So the counselor picked up on Sajan’s interests and suggested rehabilitative training at Natyakulam NGO in Jaipur, where they help visually impaired males overcome their inhibitions and build a personality through art forms like dance and theatre. Once Sajan learns to co-exist in a social set-up, he can pursue education or vocation of his interest. Sajan’s father is extremely happy and relieved with both short term and long term solutions offered by Eyeway. He even sought help in acquiring Disability pension for Sajan to get some financial assistance in addition to his own income. 47-year-old Neetu Garg is a resident of Hapur, Uttar Pradesh. She was born without any sign of visual impairment and spent the first few years of her life like any other child. However, at the age of six, Neetu started facing challenges with her vision. On one particular day, Neetu found it difficult to play with her friends and rushed back home when she realised that she was losing her vision. She did not tell anyone about her problem but her behavioural changes came to her mother’s notice. Her mother then took her to a private clinic where she was diagnosed with Optical Atrophy, which is a condition that usually begins in childhood. The optic nerve is affected causing a slow deterioration of vision. She visited various hospitals with the hope that her eyesight can be restored but her efforts were futile. While appearing for Class 10 Board exams, she was assigned to another centre to write her papers. During the exam, she faced difficulty in writing due to her limited vision and was suggested by the examiner to use a scribe for the remaining exams. But her family’s lack of confidence in her writing the exam with the help of a scribe and this resulted in her discontinuing further education. Neetu then decided to learn music for 5 years rather than sit idle at home. She was then advised by one of her acquaintances to enrol at the National Association for the Blind (NAB), Hauz Khas to get some training. At the organisation, she was given a general training on computer, handicraft, massage, home science, English speaking skills and reading Braille. Along with this, she resumed her education from Class 10 in 2017 and is now studying in Class 12. The Eyeway counselors at NAB have been regularly engaged with conducting training courses for the visually impaired and it was at the NASSCOM-NDLM certificate course in Hauz Khas where Neetu came in contact with our counselor. Here, she was taught how to use various mobile applications such as how to book an OLA or an UBER Cab, listen to songs on YouTube, navigate with Google Maps and Nearby Explorer, read using Smart Lens, socialise through apps such as Facebook and WhatsApp, use the mobile calculator and how to download songs and accessible study materials. This training paved way for her independence and motivated her to pursue higher studies. Currently, she is enrolled in an advanced computer course at NAB, R K Puram under the supervision of the Eyeway counselors. She conveyed her aspiration to start a business as a masseur. On hearing this, the counselor apprised her on the various self-employment loans available under the MUDRA scheme that would financially aid her on this endeavour. 46 year old Harish Bansal Kumar is a visually impaired person from Moga, Punjab. He had poor vision right from his young age and was advised to wear glasses. 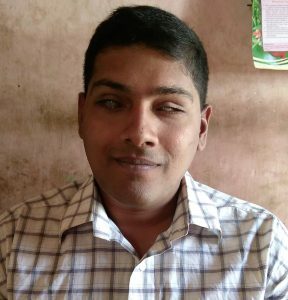 With limited vision, Harish managed to complete his education from a mainstream school. He then went on to work at the Gram Panchayat catering to the needs of the people in the society and also assisted in the wholesale grocery store run by his elder brother. In 2009, Harish had a complete loss of vision and was taken to various eye specialists, searching for a cure. To his dismay, there was nothing that could be done to restore his eyesight and the sudden alteration to his lifestyle was disconcerting. He faced challenges in mobility and was dependent on his wife to move out of his house. Therefore, he decided to enroll in a training program at the Vocational Rehabilitation Training Centre (VRTC) in Ludhiana, Punjab. There, he was given computer training for a year and simultaneously taught how to read Braille. During his time at the Centre, he volunteered to teach other blind students who had joined there. Currently, Harish works as an Office Assistant in Nagar Nigam Jalandhar, Punjab. Harish had come to know about Eyeway through one of his acquaintances and had been in contact with the counselors since 2016. Recently, Harish had opened an account in one of the local banks in Moga where he faced difficulty in obtaining an ATM card. The bank authorities denied him one on grounds of his disability. Hearing this, the Eyeway counselor apprised him of the RBI guidelines under which visually impaired people are entitled to all banking services. Harish was asked to present RBI guidelines along with a circular issued by the Indian Banking Association (IBA) to the respective bank as proof. On following our advice, Harish was able to obtain an ATM card and cheque book for himself. He was also given guidance on the steps to apply for a UDID card and the counselor keeps him updated on the status of the application. Bhupendra Singh Mehta hails from Bageshwar district in Uttarakhand. Up until 2014, Bhupendra led a normal life, married with two children, working in an automobile company in Gurgaon as a technical supervisor. However, his life took an adverse turn when in 2014 he suddenly began to lose vision. 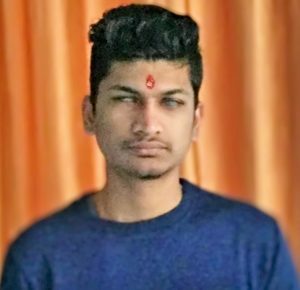 Bhupendra and his family rushed to see eye doctors and he was diagnosed with Retinitis Pigmentosa, a disorder where the patient’s vision degnerates progressively. 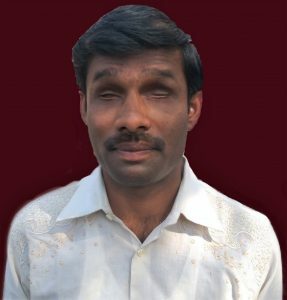 Facing difficulty with sight loss, Bhupendra had to leave his job. Since he was the sole bread winner, his personal life took a hit when his wife moved out with his kids given the financial crisis. This made Bhupendra desperate for a job. He wanted to earn once again so he could feel independent enough to take care of his family. But he did not know what options he had as a person with visual impairment. 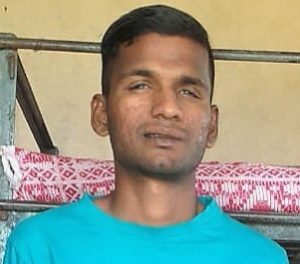 Since he was in the technical line of work and had only studied till Class 12, someone suggested him to join the Industrial Training Center at National Institute of Visually Handicapped in Dehradun. But due to lack of information and complete understanding of employment options, he couldn’t find himself a job even after completing a course for Computer Operator and Programming Assistant. Four years after his sight loss, now 35 years of age, he was still desperate for help. He called the Eyeway Helpdesk seeking employment opportunities. Our counselor immediately asked Bhupendra to upload his resume on various job portals alongside sharing it with the Eyeway team. In addition, to improve his job prospects, the counselor suggested him to pursue graduation and start preparing for competitive exams. This would enable him to apply to government jobs reserved for persons with visual impairment. 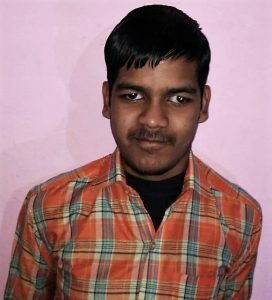 The counselor also referred Bhupendra to organizations like Sarthak Educational Trust and National Association for Blind in Delhi which could help him with placement options and further training where necessary. 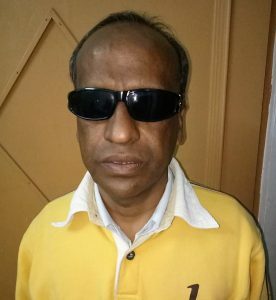 Eyeway counselor realized that apart from immediate employment, Bhupendra also needed close guidance in accepting and learning to live a life with blindness. Bhupendra is diligently following all of Eyeway’s suggestions and has already interviewed for a few jobs post our intervention. We hope he soon gets a job so he can regain his lost confidence and possibly reunite with his family. 38-year-old Hajra Shaikh lives in Parbhani, Maharashtra. At 15, Hajra was diagnosed of a progressive eye disorder called Retinitis Pigmentosa and she started to lose her vision gradually. She struggled to complete her Class X and quit formal education soon after, slipping into depression. An only child to her parents, Hajra’s family encouraged her to fight back and face life’s challenges. After a gap of few years, she somewhat accepted her situation and resumed her education. She was determined to work hard and seek employment for herself so that instead of being a burden on the family, she could be a provider. Hajra decided to become a teacher but despite all her qualifications, she couldn’t secure a stable job. Her next option was to get a government job and she appeared for banking and teaching exams. While preparing for her exam for an Assistant’s post advertised by the RBI, Hajra faced some issues pertaining to the scribe guidelines. Looking for assistance online, she stumbled upon Eyeway toll-free number and called our Helpdesk in Mumbai. The counselor helped resolve her immediate query and Hajra started a dialogue with Eyeway. The counselor realized that despite all her educational qualifications, the lack of a secure job troubled Hajra. She also seemed unprepared to deal with a further deterioration of her eye condition. So as solutions, the counselor suggested Hajra to explore self-employment options alongside applying for a government job. Since the number of people seeking government jobs is reasonably high, the chances of obtaining one are low. So Eyeway redirected Hajra to apply for a loan from the Maharashtra State Handicapped Finance and Development Corporation and start something of her own. Following our suggestion and advice on how to submit a business proposal, Hajra got a loan sanctioned to start a business of cosmetics along with her mother. When she shared her relief and happiness with Eyeway, the counselor reiterated the need for her to pursue a proper rehabilitative and mobility training so that she can operate her business with ease and carry on with her life independently. But as in the case of Hajra and several other callers who contact the Eyeway helpline, we realize that there are limited job opportunities available for visually impaired people. Government sector has a reserved quota of jobs, specifically categorised for persons with vision impairment and a large section of population to cater to. Private sector too has very limited offerings. There is a critical need to spread awareness regarding the potential of blind people in the country and their capacity to perform a host of mainstream jobs. 20-year-old Durga Kumari was born in Etah, Mainpuri district as a sighted child. At the age of 4, she got high fever and due to improper medical help she lost her vision. She pursued her primary education from a mainstream school till Class V with the help of her family who read out the course material and notes to her. Her family comprising of her mother and elder brother, moved to Delhi in 2009. But due to unawareness of any organizations or schools to help blind children, Durga was confined to her home without access to a formal education. However, she continued with personal tuitions at home. 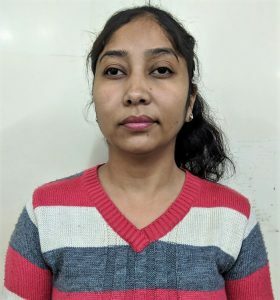 In 2015, when her elder brother took her to AIIMS to get a Disability Certificate, they were informed about National Association for Blind, Delhi where they came in touch with the counselors on the Eyeway Helpdesk. When the Eyeway counselor got to know that Durga was presently pursuing Class X, he informed them about the scribe facility which she could avail for her board exams. He helped them with the required information and Durga was able to sit through her exams with appropriate assistance in writing. Post her exams her brother approached Eyeway for further counseling regarding Durga’s future prospects including her higher studies. Our counselor observed that Durga was reclusive in nature and hesitant so he suggested her brother to get her enrolled at NAB, India Centre for Women (NAB-CBW) in Hauz Khas where she could build her confidence and make new friends. He apprised them about the basic computer training course which would help her in accessing books and study material. Following NAB-Eyeway counselor’s suggestions, at NAB-CBW, Durga trained in handicraft, cooking and computers. She also learnt how to use a white cane, which helped her in mobility. Durga has been in constant touch with the NAB-Eyeway Helpdesk for new government schemes, assistive technology uses, education and training opportunities etc. She will be appearing for her XIIth Board exams from NIOS this year. 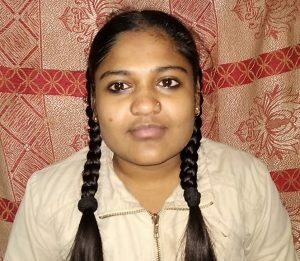 Durga wants to study further and pursue her graduation. Realizing her academic ambitions, her brother in consultation with our counselor bought her a laptop with screen reading software so she can access study material seamlessly. And alongside her educational pursuit, the counselor also recommended that Durga join the ‘Discovery Hands’ course at NAB CBW. In this one year course, visually impaired women are trained for a detailed manual breast examination, thus creating a potential employment. Durga expressed an interest in taking up this course along with her graduation. Since they are financially weak, Eyeway counselor explained the procedure to apply and avail disability pension. More than everything, Durga and her family acknowledge NAB-Eyeway’s contribution in making her a confident independent woman who is keen to chase her dreams.